It's no secret the steep decline in oil prices are having a significant impact on Canada's energy industry. But the drop in the commodity price is affecting those outside the sector, who rely on resource revenues to help fund new schools, transit and other projects and services. Tomoko Vishnu wakes before 6 a.m. each weekday to make a lunch and pack a school bag for her 10-year-old son, before he catches the bus for a 40-minute ride to school. A trip she had hoped her kids would never have to make. "We bought this house because it said a school was going to be built in this neighbourhood. That's why we bought this house here," she says. That school was supposed to be built just a five-minute walk from Vishnu's house in southeast Calgary. It is supposed to open next year, although she says there is still no sign of it. Adding to her concerns, the provincial government is reviewing all capital projects, including hospitals, schools and highways. "Nothing is happening right now and I am just hoping that it's not going to affect anything like a budget cut for the school because it has already been a lot of stuff cut," she says. The price of oil has plummeted from highs of more than $100 less than a year ago to around $50 today. That has had a huge impact on Alberta's energy industry, which has seen companies slash spending and shed employees. But it also hurts the provincial government, which counts on energy royalties for about 20 per cent of its revenue. "The fact of the matter is, when you have a $7-billion hole in your budget some decisions are going to have to be made and it's going to affect decisions across the board," says Alberta's Finance Minister Robin Campbell, who has put all capital projects in the province under scrutiny. That includes a proposed cancer treatment centre in Calgary. The facility was approved by former premier Alison Redford to be built by 2020. That timeline no longer seems plausible. "Why in a matter of months do we go from the 'have' province that everyone admires to a province that has these incredible budget challenges that means we can't be a modern, progressive province that can look after its citizens," says cancer survivor John Osler, who is part of a group pushing to have the centre built. The answer is simple, according to University of Calgary political scientist David Stewart, Albertans have chosen a government that relies too heavily on energy royalties and too little on tax revenue. 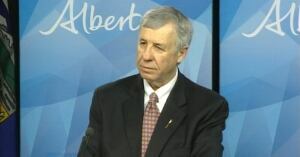 "If Alberta taxed at the level of the next lowest province, not the provincial average, it would bring in $11.6 billion in additional revenue and that would make all of this go away," he says. Of course that is easier said than done. Many Albertans cringe at the possibility of higher taxes, proud to be the only province without a sales tax. But some people would be open to the idea. "I have got no problem with a sales tax, but I understand that is a hard sell for Albertans," says Adam Johnson, who spends 90 minutes a day taking a crowded bus between a Calgary suburb and his downtown oil and gas job. "Calgarians are demanding a train, now we are demanding someone to pay for it," he says. Johnson would like to see a proposed light rail line project become a reality. The city would need significant provincial funding before ever breaking ground. When the province could be in a position to pay for that train, or any other infrastructure, will become a little clearer next month when Alberta's budget is released. But in Canada's energy capital, the fate of many projects will likely continue to hinge on the price of a barrel of oil.